The 2019 postseason got underway on Saturday with a four-game slate leading off the first day. The action started with the No. 3 Philadelphia 76ers taking on the No. 6 Brooklyn Nets in the first game and it wasn’t exactly what many expected. Even with Joel Embiid being in the starting lineup, the Sixers weren’t able to get the job done as the Nets came away with a 111-102 win. D’Angelo Russell led the way for Brooklyn with 26 points on 10-of-25 shooting while Caris LeVert added 23 points off the bench. The Nets were aided by the fact that they connected on 11 of their 26 attempts from beyond the arc. Also in the East, the Toronto Raptors and Orlando Magic played an incredible game that stands as the leader in the clubhouse for his best game of the postseason. After trading haymakers in the final minutes, D.J. Augustin hit a 3-pointer from the top of the key in the closing seconds to give the Magic a shocking upset win. Meanwhile, the Western Conference saw the top-ranked Golden State Warriors show why they’re the favorites by rebuking a strong effort from the Los Angeles Clippers. It didn’t come without drama though, as both Kevin Durant and Patrick Beverley were ejected. Finally, the San Antonio Spurs capped off an upset-heavy day by taking down the Denver Nuggets on the road in a nail-biter to get off to a 1-0 lead in their series. DeMar DeRozan didn’t have his best shooting night on Saturday, but he did enough to help the Spurs get an upset victory in Game 1 over the Nuggets. He finished with 18 points, 12 rebounds and six assists to get his squad off to a great start in their series. Nikola Jokic made history on Saturday night by recording a triple-double in his first playoff game. He finished with 10 points, 14 rebounds and 14 assists, but it simply wasn’t enough, especially from a scoring perspective, as the Nuggets fell to the Spurs in Game 1. It’s only day one, but Derrick White might have just thrown down the dunk of the postseason. Slicing through the lane, he absolutely crushed a righty jam on Paul Millsap’s head. 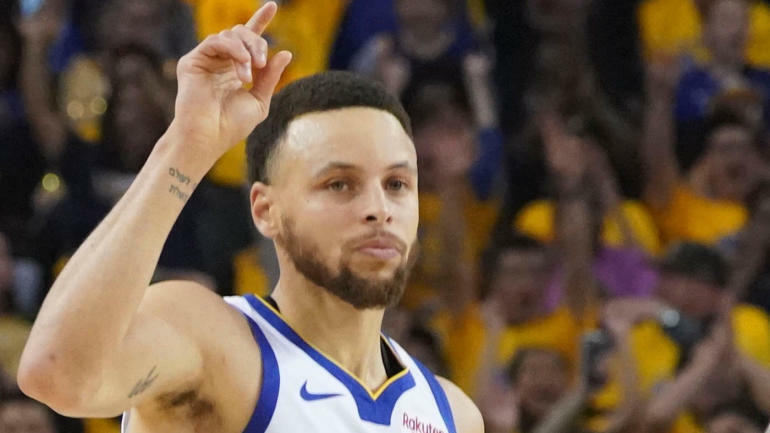 Steph Curry is arguably the greatest shooter of all-time, and now he has another 3-point record to his name. In the fourth quarter, Curry passed Ray Allen for the most postseason 3-pointers in NBA history. It was the highlight of an incredible game from Curry, who finished with 38 points, 15 rebounds and seven assists. Lou Williams is one of the craftiest scorers in the league, and he broke out all his tricks in the second quarter to get a bucket. First, he used some fancy dribbling skills to get into the lane, then he flipped up a high-arcing floater to beat the defense. Two games, two upsets. After the Nets took down the Sixers, the Magic took down the Raptors thanks to some late-game heroics from D.J. Augustin. The veteran point guard drained a 3-pointer from the top of the key to give the Magic a 104-101 win in Game 1. The closing minutes of the fourth quarter in Toronto were just fantastic, with the two teams going back and forth, making big shot after big shot. Of course, we know how it ended with Augustin’s 3-pointer, but the highlights are well worth re-watching. Pascal Siakam showed off his improved offensive game with a nifty little dribble move that got him free for a powerful slam through traffic. Caris LeVert has one of the best stories of the season after coming back from a devastating leg injury, and he continued to write the tale in Game 1 against the Sixers. The Nets guard came off the bench to put in 23 points and help his squad pull the upset. Jimmy Butler came to play on Saturday afternoon. He poured in a playoff career-high 36 points on 11-of-22 shooting from the field and grabbed nine rebounds. Unfortunately, he was just about the only Sixer who played well, as Philly lost Game 1 to the Nets. Spencer Dinwiddie has really been a remarkable find for the Nets and continues to show why. With Boban Marjanovic guarding him in the corner, Dinwiddie decided to exploit the mismatch and threw down a baseline slam dunk as he blew by the Sixers big man. Nets center Jarrett Allen has had a knack for blocking several high-profile players throughout the season. In the opening quarter, Allen was able to block a layup attempt from Tobias Harris as Harris cut to the basket.